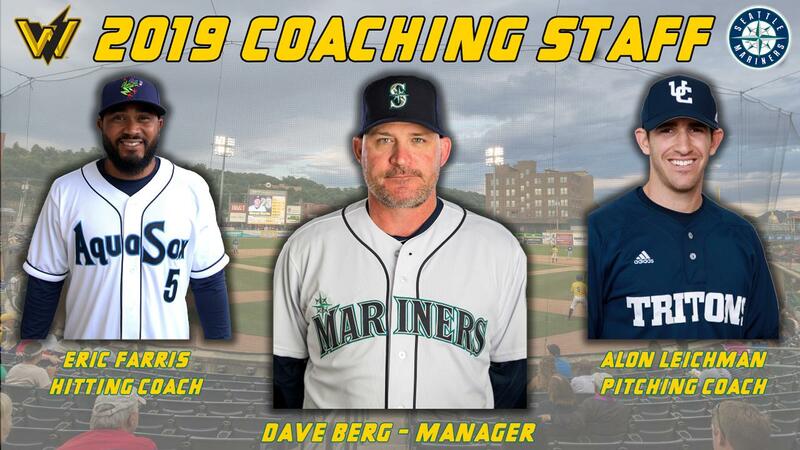 CHARLESTON, W.Va. (January 14, 2019) -The West Virginia Power, in conjunction with the Seattle Mariners, has unveiled its full coaching staff for the 2019 season. Dave Berg will make his return to the South Atlantic League as the team's manager, while Eric Farris jumps from Everett, Wash., to Charleston as the club's hitting coach and Alon Leichman takes on the pitching coach duties. Josh Gallagher will serve as the team's Athletic Trainer and Kevin Childs will be the team's Performance Specialist. Berg, 48, is in his third season with the Mariners organization, and his first as a manager within Seattle's system. He spent the 2017 and 2018 seasons as the hitting coach for the Triple-A Tacoma Rainiers. However, the University of Miami product comes to West Virginia brimming with managerial experience, having held the manager role for six of his seven seasons in the Marlins coaching ranks, including two years in the South Atlantic League with the Greensboro Grasshoppers in 2012 and 2014. Berg was also the manager for short-season Jamestown (2010-2011) and Double-A Jacksonville (2015-2016). Selected in the 38th round of the 1993 draft by the then-Florida Marlins, Berg played five minor league seasons before making his MLB debut with the Marlins on April 2, 1998, at that point becoming the lowest-ever Marlins draft pick to debut in the big leagues. The Roseville, Calif., native hit a career-best .313 during his rookie season in the Sunshine State. After a four-year stint with the Marlins, Berg signed with Toronto in 2002, driving in a career-high 39 RBI in 109 games during his first year north of the border. The infielder also spent time in the Red Sox, Cardinals and Rangers organizations before retiring following the 2006 season. He sports a career .269 MLB average in 582 games, while boasting a .288 clip in 665 MiLB contests. Berg currently resides in Roanoke, Texas. Farris elevates to the Power from short-season Everett, where he was the team's hitting coach last season. Farris is in his third year in the Mariners organization as well, spending the 2017 campaign within the Mariners' Player Development and Scouting departments. Under Farris' tutelage last year, the AquaSox posted the third-best average (.253) and home runs (56) in the Northwest League, as well as totaling the fourth-most runs, hits, doubles and RBI. A fourth-round choice by the Milwaukee Brewers in the 2007 draft, the Arizona native spent six years with the Brewers, including making his MLB debut on July 28, 2011, after Rickie Weeks suffered a sprained left ankle. Farris played in 14 MLB games with Milwaukee between 2011 and 2012 before signing a minor league deal with the Minnesota Twins just prior to the start of the 2013 season. After three years in Minnesota, the infielder played one year with the independent Somerset Patriots in 2016 before announcing his retirement and joining the coaching ranks. The Hamilton High School alumnus posted a career .281 average across 962 MiLB games, 103 of which he spent with the Power in 2008. Farris hit .293 for West Virginia that season, smacking three home runs and bringing in 54 runs while swiping 32 bases in 42 tries. He is the 21st former Power player to make his MLB debut, and the fourth from the 2008 squad (Jonathan Lucroy, Zach Braddock and Eric Fryer). Farris had a banner 2009 campaign as well, earning Midseason and Postseason All-Star honors with Advanced-A Brevard County after boasting a .298 average with seven homers and 49 RBI and stealing 70 bases in 76 attempts. Farris attended college at Loyola Marymount after declining a 42nd-round selection by the Atlanta Braves in 2004. Leichman is also in his third year amongst the Mariners' coaching ranks. The Israel native was the pitching coach for the DSL Mariners last season after spending 2017 as Seattle's Coordinator of Organizational Learning. Prior to coming to Seattle, Leichman led the Yarmouth-Dennis Red Sox of the summer collegiate Cape Cod Baseball League to a 2016 championship. Before heading to the United States, Leichman was a member of the Israeli National Baseball team that competed in the European Baseball Championship in 2010, 2012 and 2016. To help his team reach the national tournament in 2016, Leichman hurled a complete game one-hit shutout in the C-Level qualifier in 2014. The UC-San Diego product represented his native country in the 2013 World Baseball Classic, but did not make an appearance, and also served as the team's bullpen coach during the 2017 WBC. Leichman was the first Israeli to represent his country at the MLB European Academy, which included MLB coaches such as Barry Larkin, Rod Carew, Lee Smith and Bruce Hurst. After coming to the States, Leichman went to Cypress College from 2010-2013, spending three years as a member of the baseball team, including a medical redshirt in 2011 due to Tommy John surgery. He rebounded in 2013 to guide the Chargers to a CCCAA state title, including logging a complete-game shutout to win the super regional in a spot start. Leichman then headed to San Diego, where he held a three-year stint as a Triton and earned his history degree. He led the team to back-to-back postseason appearances after posting a career 3.50 ERA in 122 innings with 85 strikeouts compared to 20 walks. Gallagher joins the Power as the team's Athletic Trainer after holding the same title in Everett in 2018. The Olympia, Wash., native came to Seattle in 2018 after earning a Masters of Science in Kinesiology at the University of Mary. He also graduated undergrad from the University of Mary with a Bachelor of Science in Athletic Training and a Minor in Wellness. He was a part of the Marauders' Athletic Training staff as a Graduate Assistant Athletic Trainer while he pursued his Masters. Childs enters his fourth season as a Performance Specialist with the Mariners, also coming to the Power from the AquaSox. The Greenville, S.C., native played college baseball at Lander University and Wingate University before securing his Masters Degree at Appalachian State University in Exercise Science with a concentration in Strength and Conditioning. Childs was previously a strength and conditioning coach at Appalachian State, Clemson and Lander University. The 2019 season kicks off April 4, 2019, and full season and mini-plan packages are available now by calling 304-344-BATS or visiting wvpower.com.